Jennifer Lawrence is a rather versatile actor. Whether she's playing the leader of a revolution in The Hunger Games or a metaphorical Mother Nature in mother!, Lawrence is known for being as much of a chameleon with her acting as her character of Mystique is in the X-Men franchise. 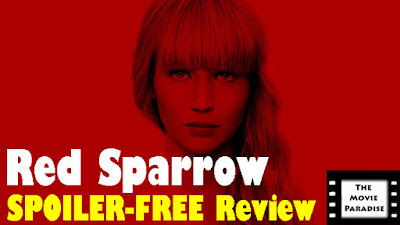 With Red Sparrow, Lawrence portrays Dominika, a desperate woman looking to take care of her sick mother, and will do this by any means necessary. The means are becoming a Red Sparrow, a special Russian operative who uses his or her body in order to seduce people for the betterment of the country. Dominika's task is to get close with an American CIA agent, played by Joel Edgerton. But it is never quite clear as to which side she is truly on, as she expertly plays both sides in this increasingly tense battle over intelligence between the two countries. Led by her Hunger Games director Francis Lawrence, Jennifer Lawrence turns in another great performance, even if the film itself is too long and slowly paced. The worst sin a thriller can commit is being boring. If the movie is boring, then what is it all building towards? Luckily, Red Sparrow isn't boring. It is entertaining for the entirety of the movie's (long) runtime. However, it just barely strings me along. The story is interesting enough to keep you invested, and makes you want to know what is going on. However, it is not a fully riveting story. I wasn't kept on the edge of my seat, dying to know exactly how all the puzzle pieces fit together. A truly great thriller will take you hostage, and won't release you until it ends. Red Sparrow is an adequate thriller. It does not commit the cardinal sin of being boring, but it is not exactly engaging. The story could have been reworked in order to make it flow better. Francis Lawrence could have done a better job in crafting the film so that it did keep you on the edge of your seat. These are all things that didn't happen, which unfortunately keep Red Sparrow from being a movie that will be remembered a year from now. I would be remiss to not mention Jennifer Lawrence's performance. She gives it her all. We have seen her mail in performances before, particularly with X-Men: Apocalypse. However, with Red Sparrow, Lawrence does her best to keep you interested. Part of the reason I like this film as much as I do is because of what Lawrence brings to it. However, an average script makes for an average movie, no matter how strong the leading performance is. One would expect a film like Red Sparrow to be littered with high stakes action scenes, and yet there really aren't any. There are some brutal fights, but these are more bloody struggles for survival rather than actual stylized action sequences. But the strangest part of this is that I didn't find myself yearning for any big, over-the-top action scenes in this movie. I found myself content with what we got. This is no Atomic Blonde, with giant action set pieces where Charlize Theron tears through countless nameless henchmen. The focus of Red Sparrow is character development and plot development. But even though both of those elements are not as strong as they could have been, I was never wishing the film had those action scenes. What we get works for the film; it just could have been done a little bit better. The movie has several twists and turns throughout, which I found to be well realized. It does not quite have the level of umph the filmmakers were looking for, but it is enough for me to appreciate the cleverness of the writer. I simply wish the movie in its entirety was written with the same level of cleverness as some of these twists and turns are. Overall, Red Sparrow is entertaining enough, though it is hard to become fully invested in it. Jennifer Lawrence turns in a great performance, and does her best to keep you engaged in the film. However, everything stems from the fact that the screenplay is simply average. It isn't bad; I've seen far worse films. However, it isn't a great screenplay, and that leads to it being a mostly average movie. While it is an interesting story with a lot of great twists and turns, the pacing is too slow and the film overall is too long. These factors dilute a lot of the better aspects of the movie. The main mission Dominika goes on is not nearly as compelling as her time in the Academy is, and it makes you wish the film was restructured a bit to give more emphasis to this beginning part, as it is the best part of the movie. The film doesn't have any real action sequences which, surprisingly enough, I didn't find myself missing. In the end, Red Sparrow has all the makings for a great film. However, it doesn't quite work out to be that. But that does not mean it is a bad movie. There is enough in Red Sparrow to keep me entertained and invested, even if it is only mildly. What do you think? Have you seen Red Sparrow? If not, are you planning on seeing it? Leave your (spoiler-free) thoughts in the comments section below.